Location: Porcupine Mountains State Park. Character: Remote northwoods stream with a couple good ledge/drops. The resolution on Google Maps for this area is excellent. We highly recommended going to the 'Map' tab, clicking 'USGS Aerial' 'Satellite', double-clicking the put-in, zooming in to the maximum resolution available, and doing a 'virtual walk' of this reach! Put-in is in Porcupine Mountains State Park at the Nonesuch Falls parking area, a short distance off South Boundary Rd, which is not plowed free of snow during the winter. Early season attempts at accessing this run may be thwarted by the road still being impassible. From the parking area, carry above or below the falls. Nonesuch Falls is a low angle slide (perhaps 20' total) and fairly straightforward. Good gradient extends for perhaps a quarter mile upstream of this point, so one may wish to carry up a bit further to enjoy it as a warm-up. Downstream from here, one should encounter bolderbed rapids with occaisional low ledges. Pewabeck Falls is a series of low ledges encountered 6 miles into the run. As this is a smaller stream, expect that strainers may be a problem in places. The (much larger) Big Iron lies immediately to the East of this run, and may be a great 'companion-run' (if they prove both to be at runnable levels) or the runs may be 'fall-back' runs for each other in the event one is too high (or low) and the other may be runnable. USGS lists a sampling site just upstream of our take-out (Hwy.107) showing a drainage area of 17 square miles. 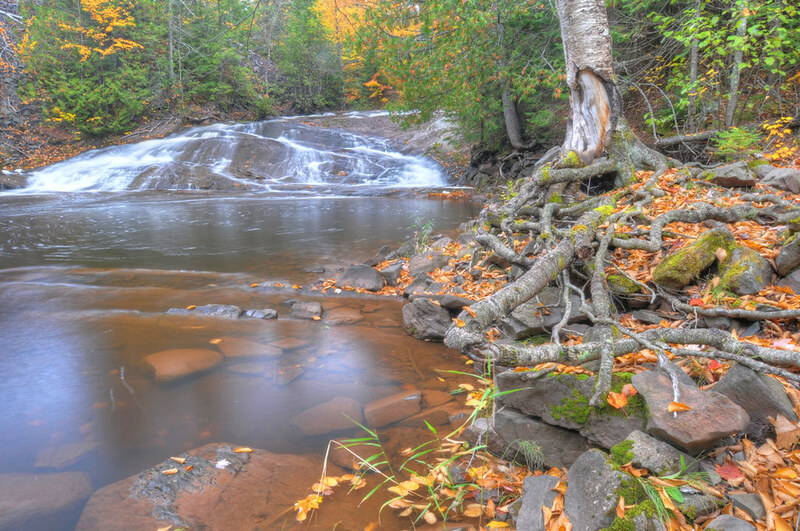 The falls is "adjacent to the old Nonesuch Mine ruins as well as a mining ghost town of the same name. The Nonesuch place name originated from the uniqueness of the geology in the bedrock: "none such" rock—copper-containing sandstone—had ever been found before." Described as a four-foot drop. Visual at put-in at Nonesuch Falls. This is a somewhat smaller watershed than other rivers in the area, so it will require other area rivers to be fairly high.